American Crane recently had the opportunity to open their facility to the ImmERge Labs, an Upstart company spun out of the University of Pennsylvania, to introduce their employees to some of the newest and most innovative technology being applied in the medical field today. After recently completing their official CPR certification training, American Crane’s employees had the chance to experience what would happen in a real life situation where they had to perform CPR through ImmERge Labs’ new CPR Virtual Teachable Moment℠ program. Selected American Crane’s employees, including members of their safety committee, are required to participate in and complete official CPR training to renew their certifications every 2 years. In June, this group completed the training and certification. Thus the timing could not have been better for ImmERge Labs to share their innovative technology with the American Crane. This experience allowed employees to use a virtual reality head set and save the life of a civilian in a realistic environment. The program renders participants motion from a slight movement of their fingertips, to a full body 360 degree turn- in a virtual digital setting. Since this technology was such a hands on experience, it really ingrained the CPR the users’ minds and will help them so that they won’t forget what to do if they are ever actually in a similar real life experience. It is important to know that the Virtual Teachable Moment ℠ does NOT replace CPR certification training at all, but truly compliments and enhances it. It gives users the chance to engage a simulated emergency and gain a real life experience responding to a sudden cardiac arrest scenario. It provides participants the opportunity to apply their CPR training and also reinforces the lessons learned during CPR certification. Feedback on the ImmERge Labs Virtual Teachable Moment was extremely positive. Everyone who tried it thought it was extremely helpful, very interesting, and an overall great experience. American Crane is excited to see how this technology will evolve even more in the future and how they can incorporate it into their own training programs. ImmERge Labs uses virtual and augmented reality to re-imagine how the world prepares and trains for emergency situations. Their highly realistic, multi-sensory applications integrate a victim manikin to provide participants not just the skills needed to save lives, but emotionally and mentally prepare them to respond when needed. 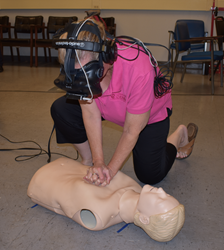 A University of Pennsylvania startup, the company’s flagship product, a VR platform to help enhance CPR and response skills was developed by Founder Marion Leary through her resuscitation science research at Penn Medicine. As the winner of Penn’s 2017 AppItUp Demo Day competition, ImmERge Labs recently earned a $50,000 offer of investment. For more information, visit immergelabs.strikingly.com.